After Breakfast drive to Nubra Valley via Khardung La (Highest Motor able road in the World, 18,380 ft) Arrive at Hundur by afternoon. Lunch at Camp, rest of the day one is free to explore Diskit, Hunder Villages and camel Safari in Sand Dunes between Diskit and Hunder Village. 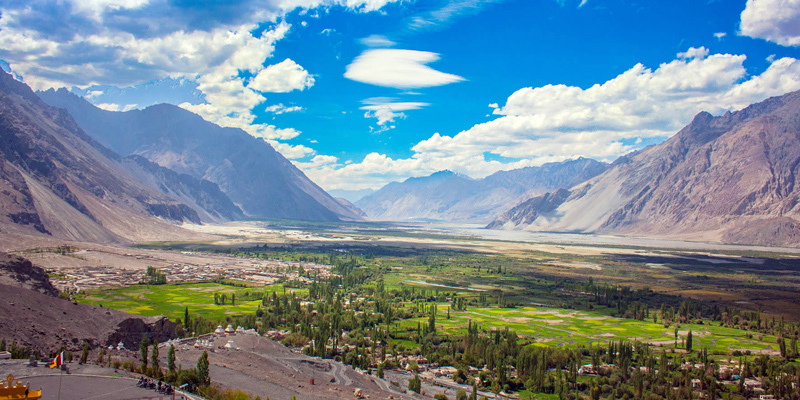 Overnight stay at Nubra Valley. After Breakfast visit Diskit Monastery, where you can have a magnificent view of Nubra Valley and drive to Sumoor village and back to Leh by same Route, crossing Khardung La Pass. Overnight stay at Leh. After early breakfast drive to Pangong Lake. Pangong Lake is the biggest high altitude lake in Asia 165km from Leh. Enjoy the turquoise color panoramic lake and the magnificent mountains. Drive back to Leh by the same route. Overnight stay at Leh.